Charging MicroBot Alert. MicroBot Alert uses a Micro USB charger (included). It takes around 2 hours to fully charge. Checking the battery level. The battery level can be seen on your MicroBot Alert's dashboard. 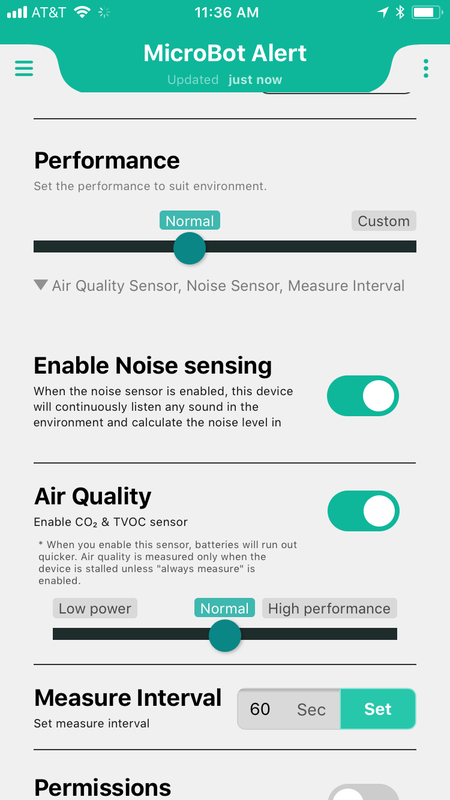 The sound sensor uses the most energy followed by the air quality (CO2 & TVOC) sensor. For this reason, these sensors are disabled upon first pairing. The more frequently you require the MicroBot to communicate (i.e. the measure interval in seconds), the faster the batteries will run out. Use the performance bar under settings or manually change the measure Interval seconds to extend the battery life. If your MicroBot does not last this long it is likely due to the quality of the AAA batteries or the environment (eg. extremely cold). See additional instructions under settings below the Air Quality and Timer for tips to extend battery life between charging.